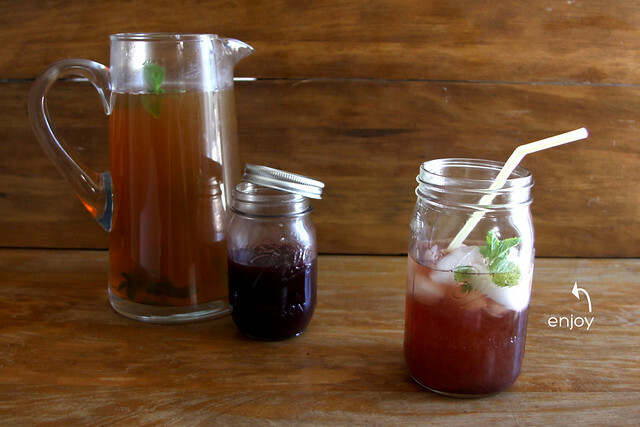 a few years back, in a restaurant, i tasted an iced tea that hooked me, blackberry mint iced green tea. being hooked, and really not wanting to wait for a visit to the restaurant to get a taste, i came up with my own recipe. now here's the deal, there are two ways to make the syrup. there is the good way and then there is the great way. the good way involves pre made blackberry preserves. the great way involves fresh berries, a bit more time consuming but well worth the wait. bellow are directions. over a medium high heat whisk together the blackberry preserve & cup of water. bring to a soft boil. set aside and let cool. *cheesecloth for straining the blackberry seeds. 1. blend together all ingredients in a blender. 2. stretch cheese cloth tightly over a bowl, it makes it easier if you rubber band the cloth to the bowl. pour the blackberry mixture over the cheesecloth to separate the seeds from the liquid. 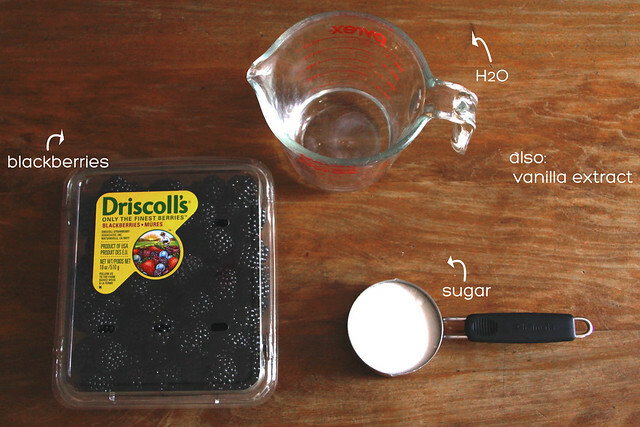 3. over a medium high heat bring the blackberry mixture to a boil, stirring constantly, for 10-15 minutes. 4. remove from heat & let cool. brew tea for as long as you like according to the strength you prefer. i brew mine for 4 minutes, i like it a bit stronger. 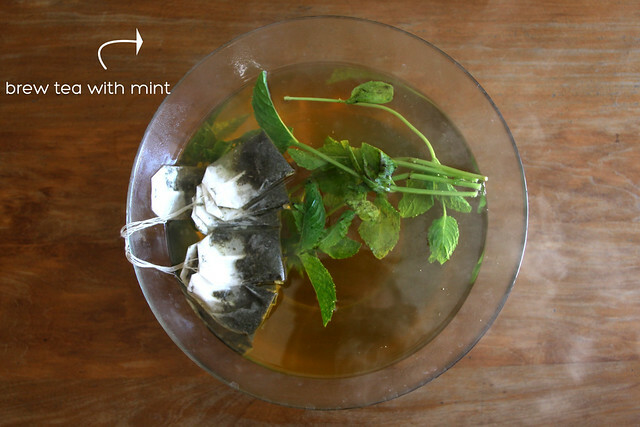 the mint i allow to brew for 10-15 minutes. chill in the fridge. 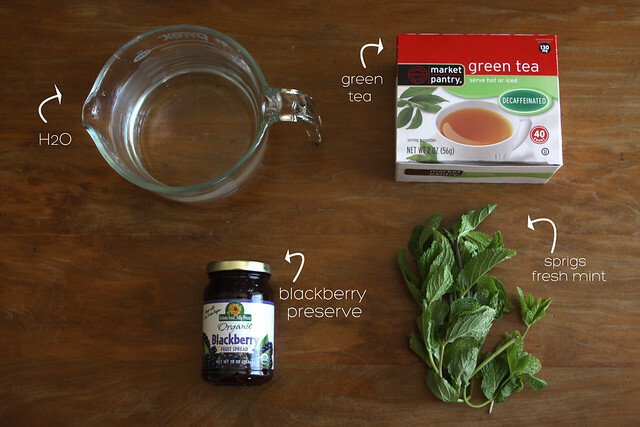 add anywhere from 2-4 tablespoons of syrup to tea. while i've made the syrup both ways i have to tell you that the syrup from the fresh berries proves to be the most flavorful. try out the the recipe let me know what you think. I am so excited to try this Bex, it looks amazing! Yum! oh my gosh! this looks AWESOME! and so refreshing! i can't wait to try this!!!! that sounds amazing! need to make it soon! Crap that was good! Just made a pitcher today for brunch with a friend and we demolished it! Thanks!